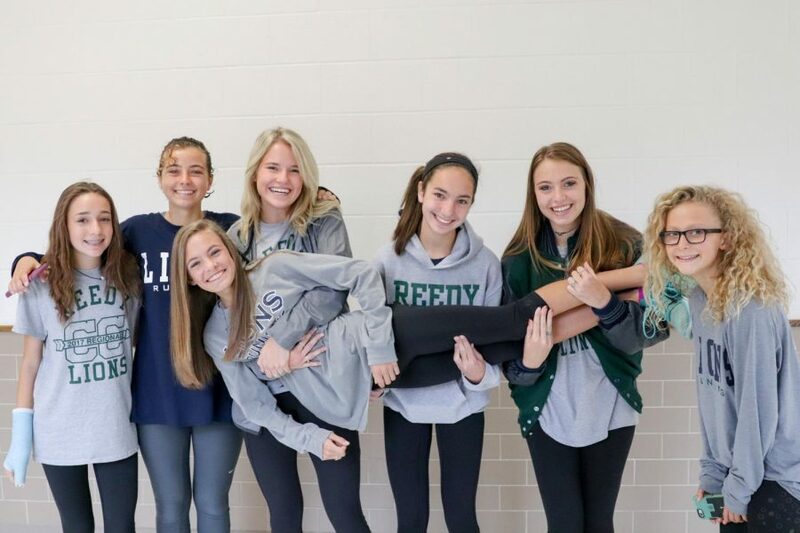 Varsity Cross Country holds freshman Colleen Steggman after the State Send Off in the hallways at Reedy. Feet pound into the rough and natural terrain as cross country runners take in the open-air in gulps. Their lungs sting as they push through the last portion of the race. The finish line is only yards away, and determination drives the runners to finish ahead of the competitors scattered along the course. After nine years of dedication, Cross Country runner and freshman Colleen Stegmann qualifies for the UIL State Championship, held on Saturday, Nov. 4. She finished the mileage in just over eighteen minutes, placing 9th overall. Cross Country Coach Becky Craig said that based on her early exposure to running and immediate love for the sport, Colleen puts forth an abundance of effort to ensure her success.. She can always be found accepting the next challenge without complaint to make herself and her team better. Now that her high school running career has taken off, the freshman qualifier concentrates on improving through daily practices and preliminary meets to maintain her persistent mindset. Although the runners compete against each other for placement in the race, the unity of the cross county team motivates Stegmann to do her best day-in and day-out.